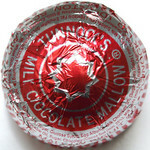 You know what I mean, those chocolate covered marshmallow domes of loveliness! And what’s got me thinking about these today? Well when I arrived on the second floor of the library I was greeted by the new edition of Eye: The International Magazine of Graphic Design: Food Special which has a huge picture of that iconic red and silver wrapped tea cake on the cover. The whole issue is devoted to all kinds of food-related advertising. I’m looking forward to reading ‘Design for Eating: From Tunnock’s tea cakes and Tiptree jam to chocolates and cookbooks…’ I’d love to be able to share it with you via the online version of Eye Magazine, but its hot off the press and they haven’t scanned it yet, so for the moment you’ll have to come into the library. ‹ Going away over Easter?